If you’ve decided to invest in your landscape, the next step is to decide if you’re going to do it yourself or have someone do it for you, which may depend on your budget. The problem is that while a beautiful yard can add value, a poorly executed or poorly planned yard can easily detract from your home’s value! If you’re having someone else construct the project, it pays to have a landscape architect design it. If you’re doing it yourself, it’s even more important to have a professional plan, so when it’s finally installed, it will look well thought out and implemented. Here’s the deal: You don’t have to install the new yard all at once — you can do it in stages — and spread the expense out over a few sessions (do the front yard, but not the back. Do the lawn but not the flowerbeds, etc.). When you’re all done, though, it will look better if it’s professionally designed. 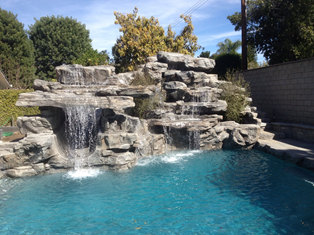 At SNYDER LANDSCAPE AND ASSOCIATES we have an in-house landscape architect who will work with you to make an attractive landscape plan that includes the hardscape (masonry, structures, swimming pools and walkways) as well as the softscape (plants, trees and flowers). Do you do it your self or hire someone? 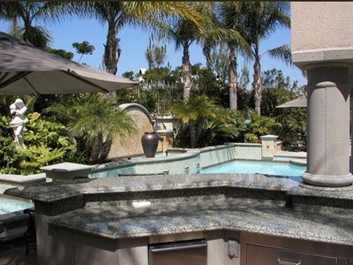 In the areas of swimming pools, spas, and larger outdoor features, like barbecue islands, outdoor rooms, patios and fire pits, your best bet is to hire someone like our company to design and install these features for you. You may be able to do some plantings yourself, but trees and lawns are still best left to the experts, especially if irrigation is involved. When you hire a contractor, what do you need to know, and how do you know if they’re good at what they do? In the state of California, all contractors must carry a current contractor’s license for the work they are doing. Find a licensed contractor through the Internet or from friends, or ask us! After making sure of the type of contractors you need, you have more work to do to make sure you have the best experience. Here are some more tips for choosing the right contractor for your project. SNYDER LANDSCAPE AND ASSOCIATES wants you to enjoy your outdoors. We urge you to research all the contractors you engage, and we hope you will obtain no fewer than three quotes for any project you’re considering. We are a licensed, insured, award-winning company that has filled our clients’ dreams for over 27 years. Let us know how we can help you achieve yours.